Nobody said that raising an adolescent was easy, and schooling one is even more of a challenge! Parents are taking on a lot of school responsibility, and let's face it -- things are different than they used to be. How are parents supposed to know how to handle the homework load without some guidance? Take studying, for example. 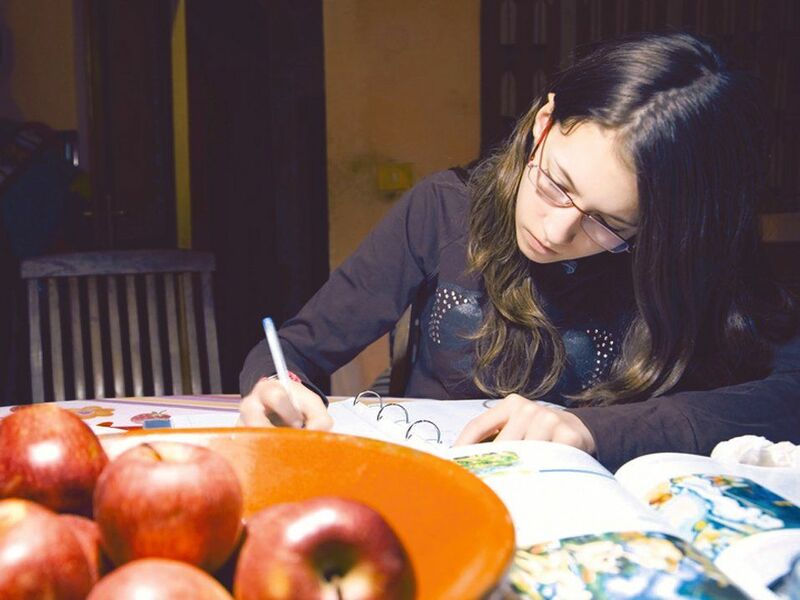 If you are a parent of a struggling or resistant learner, you've probably heard more than one person suggest, "She just needs to study more." Most kids think this means filling in a study guide or rereading a chapter. But many don't learn by writing or reading. Their strengths lie in the visual, kinesthetic, musical, or social realm. How, then, are we to help our children develop their studying skills? The task does not have to be daunting. In fact, it can actually be simple and effective! Determine when tests will happen. Use school websites, email, planners, etc. to help you and your adolescent pinpoint an effective way to get tests on the calendar. Work with your student to determine how many days of studying he needs, and make a session-minute goal (one minute per grade level) and a target for him to study twice daily. An eighth-grade student will set the timer for eight minutes each session, a tenth-grade student for ten minutes, and so on. Notes, study guides, worksheets, or quizzes from the chapter or unit are all good choices. Textbooks are easily accessible, but study material from them may be difficult to identify. Have your adolescent ask and answer her own questions, or for those of you with social students, you can join in and ask the questions. If she gets through the material before the time is up, start over! Set aside the same time increment before bed, and repeat the entire exercise. If you do the math, a sixth-grade student will study twelve minutes every day for five days, and will have put 60 minutes of no-tears studying into his pocket! But is the question-answer strategy really the best way to study? No single way works for everybody, as each child has a different set of strengths and preferences when it comes to internalizing information. Here are some other ways to use this time (also provided as a downloadable handout - see inset. This handout includes a list of practical and powerful ideas to help middle and secondary students organize brief and effective study sessions. Turn those questions and answers into flashcards and have your adolescent quiz herself. The simple act of flipping the cards around and putting them into piles of "mastered" and "needs practice" may be enough to keep an active kid moving. Some kids are motivated by timing themselves. Flip those flashcards around, have her read the answer, and try to reproduce the question for a bigger challenge. Use the flashcards to organize the information by categories, put them in some kind of order, or match them up in pairs. The idea is to organize them differently each time so that your student can make more than one connection in his brain for the information. Language lovers won't mind creating sentences with vocabulary. If the test is vocabulary-heavy, start by either writing or speaking the sentences with one word in each and then moving to two words, then three, etc. Ask a musical or rhythmic adolescent to take the lyrics of her favorite song and rewrite it to include as much of the required information she can. This may take multiple sessions to accomplish, but once it's done, she can sing it over and over again. During the study session, have a more visual adolescent draw pictures of his notes on flashcards, paper, or a whiteboard, and then describe them. Many adolescents are highly social. If yours is, too, have her go through flashcards or a study guide and explain each aspect in as much detail as possible without reading from the printed information. Have him use the visuals provided in the textbook, online text, worksheets, notes, etc. to explain information either out loud or in writing, depending on his preference. Have her rhyme or create sayings to help her remember information. Creating acronyms or sentences with the first letters of words can also be fun for students who like to play with language. Read a portion of the notes or worksheet and have your student describe what comes to mind visually. Talk or write about the material, pretending to be somebody or something else. Have a word-smart adolescent write a letter to a superhero explaining the material and why the information should be important. Ultimately, studying comes in dozens of forms, and it's important to help your adolescent figure out what's going to work for him or her. Whatever her strengths, whatever his level of comfort, start there. Keep it short. Keep it simple. Keep it painless. And watch what happens when studying becomes a familiar routine -- and when students see the fruits of their efforts.